Our products are made from the highest quality glow-in-the-dark material that glows all night long, lasts forever, and recharge by absorbing any light. UVPAQLITE PRODUCTS ARE MADE FROM Non-Toxic & Non-Radioactive STRONTIUM ALUMINATE. WHAT MAKES UVPAQLITE PRODUCTS BRIGHTER? Glow-in-the-Dark intensity (brightness) depends on the particle size; generally, the bigger the particles, the better the glow. Our products use patent pending large crystals of strontium aluminate making them brighter, charge faster, and even glow longer than other glow items available. HOW DO THE CRYSTALS CHARGE? Strontium aluminate is a photoluminescent phosphorous material, it absorbs photons (electromagnetic radiation) & UV rays to charge. It does NOT require direct or indirect sunlight to charge. It will charge well in low-level indoor light conditions. Your Eyes Should Be Adjusted to the Dark. Our products work best when your eyes are fully adjusted to the dark because the light diminishes over time. When your eyes are fully adjusted to the dark a little light goes a long way. For example, the light is measured at 39,000m immediately after charge, 1245m at 10 minutes, and 226m at 60 minutes. It continues to be visible to the human eye more than 24 hours after the initial charge. When your eyes are adjusted to the dark, 226m -3m of light still provides a functional light source. Pictured to the above are two cups each containing 10 grams of strontium aluminate, they were exposed to the same light source for the same duration. You can find glow in the dark items all around: stars on the ceiling, toys, frisbees, water bottles, stickers, clothing, and most recently emergency exit signs. All of these products utilize different glow-in-the-dark powders to achieve different levels of brightness and cost. Basically, you get what you pay for when it comes to glow in the dark . 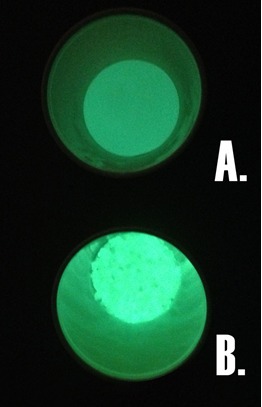 These differences can be seen when comparing the glow in the dark items bought at a dollar store to the glow in the dark exit signs like those installed in NYC buildings for safety, and the products we make.